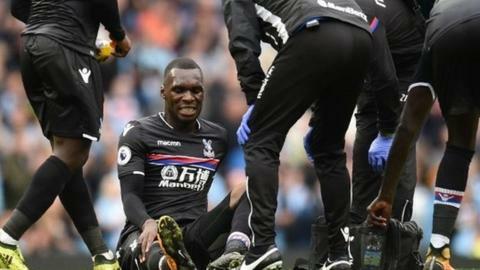 Crystal Palace striker Christian Benteke has been ruled out for at least six weeks with a knee injury. The 26-year-old Belgium international was injured during Saturday's 5-0 defeat at Manchester City. "He [Benteke] has ligament damage which will keep him out for a minimum of six weeks," said manager Roy Hodgson. The injury is another setback for Palace, who are bottom of the Premier League with no points and no goals from their opening six matches. Winger Wilfried Zaha is not ready to return to face Manchester United on Saturday following a knee injury, while on-loan Chelsea midfielder Ruben Loftus-Cheek will also miss the game due to a thigh strain. Palace signed Benteke from Liverpool for £27m in August 2016 and he has scored 15 times in 42 league appearances for the club.